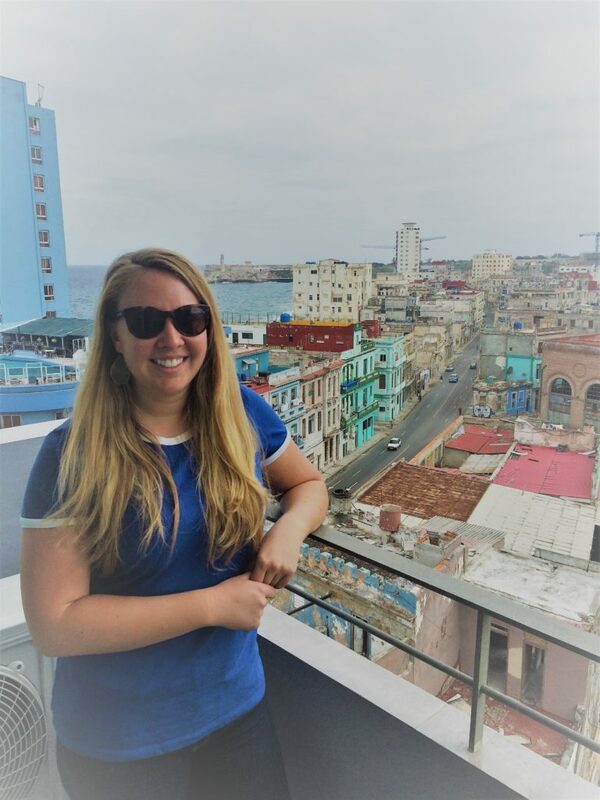 Cuba has been my top bucket-list destination my entire life, and this past January I made that lifelong dream come true with a weekend in Havana! 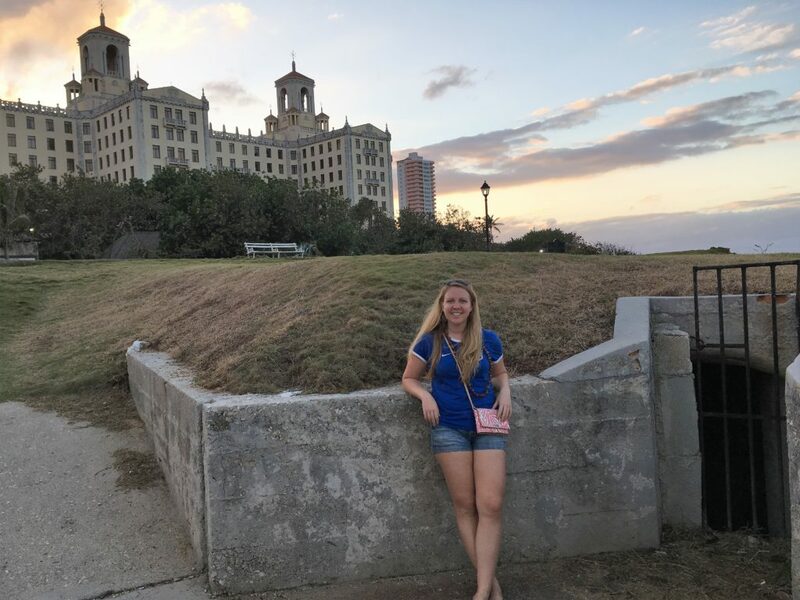 Most Americans think Cuba is off-limits for travel unless you have family living there or want to go with a humanitarian volunteer group, but after my roommate and her friends visited in December I realized how easy it is to travel there legally. Are you an American wondering how to visit Cuba legally without an expensive tour group? 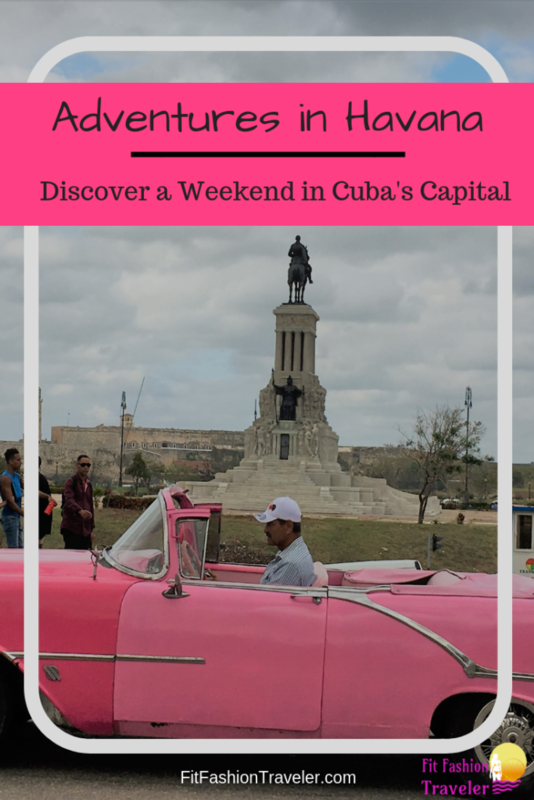 Check out my post on How to Travel to Cuba! This past winter was brutally cold in New England, so when I suggested to my dad that we check out Cuba instead of our annual Martin Luther King weekend trip to Mount Tremblant in Canada, he was completely on board. 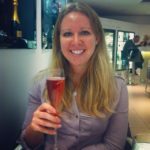 We booked our flights and AirBNB accommodations, created our itinerary, reserved our activities each day, and two weeks later were headed for Havana! We arrived in Havana early Saturday morning. Our AirBNB host met us at the apartment and let us in early so we could drop our bags before wandering around the city. 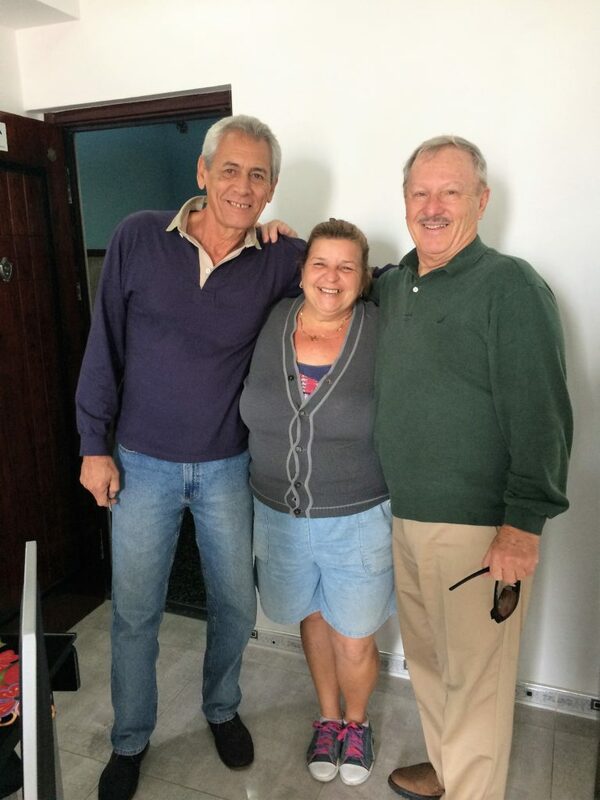 Our hosts, Roberto and Hortencia, were the most helpful AirBNB hosts ever! They spoke no English and were very patient with my broken Spanish as they explained the apartment and surrounding areas. Roberto even offered to give us a guided walking tour of the city, but seeing as my dad doesn’t speak Spanish and I was already exhausted from an hour of communicating with them, I wrote down Roberto’s suggestions and we were on our way. Our first stop was the Tobacco Factory (Fabrica de Tabac), which unfortunately was closed for repairs. We noted the prices of cigars for later and continued on our way. Note that cigar and alcohol prices are fixed in the country, so you will not get a better deal by shopping around, and if a local offers you a “better deal,” they are probably selling fake products. 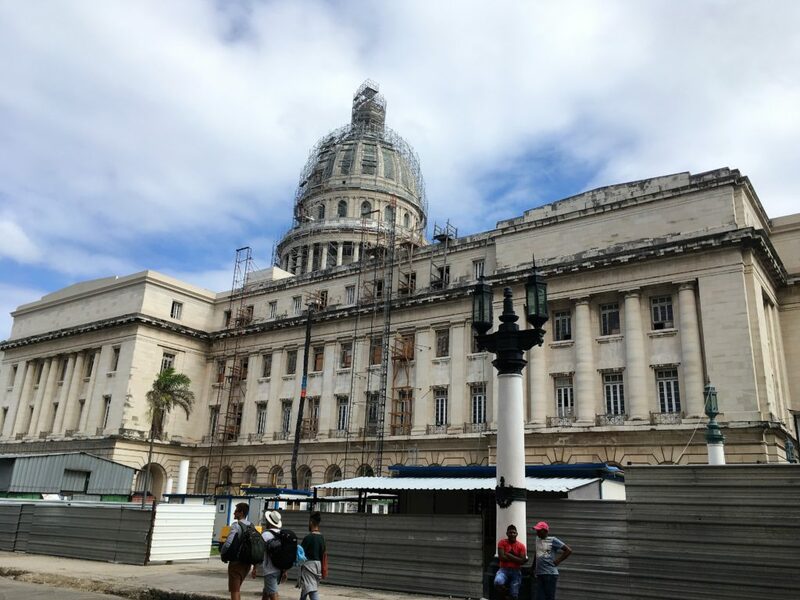 Next to the factory was El Capitolio, the capitol building and entrance to Old Havana. El Capitolio should look familiar, as it is modeled after the U.S. Capitol building. We went inside for a free tour of the rotunda, where the national symbols are on display as well as the tomb of the unknown soldier. I was most surprised to see the American flag on display along with all the other flags of North and South America, representing countries that helped shape Cuba’s history. 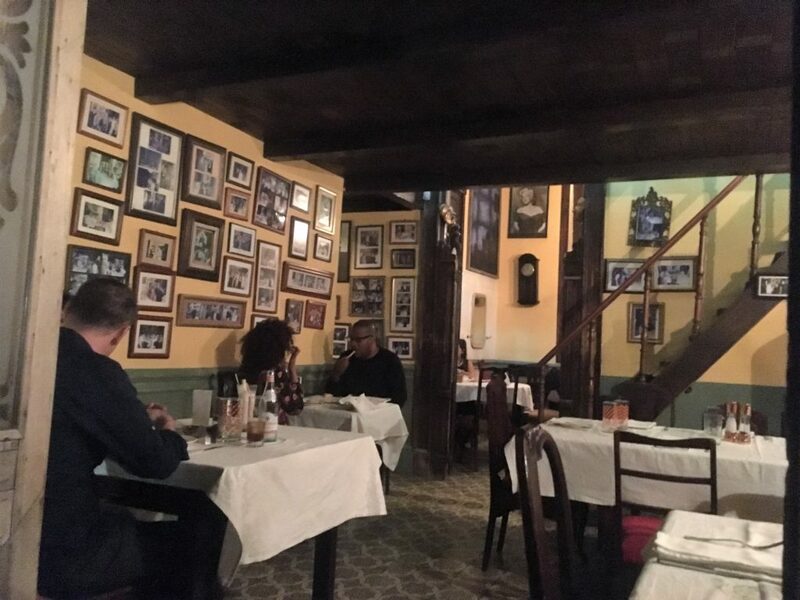 Next we visited the La Floridita bar and restaurant, origin of the daiquiri and a favorite haunt of Ernest Hemingway, who lived in Cuba for many years. 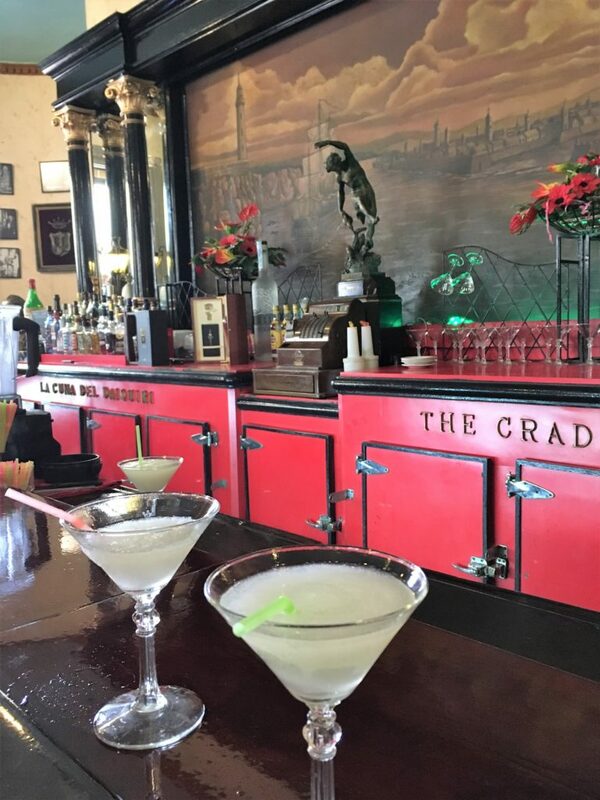 My dad and I each enjoyed an original daiquiri, which is lime-based and refreshing, rather than sweet like American strawberry daiquiris. If I were to return to one place in Havana for a drink, this would be it. After our drinks, we wandered over to the Museo de la Revolucion. Here, we learned so much about the years leading up to the Revolution before the January 1, 1959 overthrow of which the world is aware. There was also a lot of information about Che Guevara and Camilo Cienfuegos, two of Fidel Castro’s right-hand-men during the Revolution. After Cuba was won for the Communists, Che went to fight in Bolivia where he was killed by the CIA, and it is rumored that Camilo was offed by Castro shortly after he came into power to avoid a power struggle or a second revolution of the people more in favor of Camilo. Continuing with our itinerary, we went to try a mojito on the roofdeck of La Bodeguita del Medio, the birthplace of the mojito, before venturing down to the Almacenes San Jose market. Here I found jewelry and beautiful artwork to purchase from the Cuban people. The market contains your typical souvenirs, so there is nothing particularly fancy, but it’s a fun place to look around and find something to pick up both as a memory from your vacation and in support of the local vendors. Our last stop of the day was the Hotel Nacional, a large modern, luxury hotel on the waterfront El Malecon boardwalk. 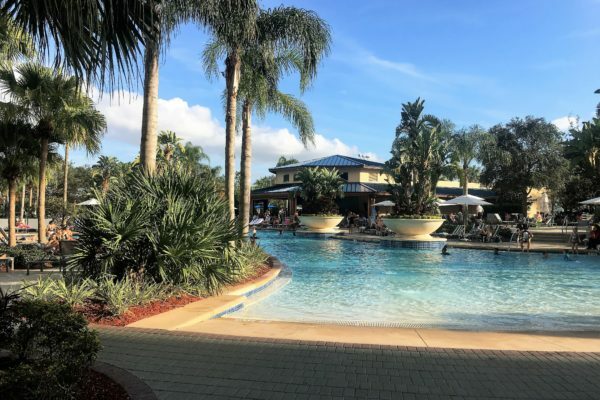 We thought the hotel must be government or military owned, so we just walked around without purchasing anything, but we found out later that it is privately owned so it is possible for Americans to have a drink and make purchases there. The coolest part of the National Hotel is the bunker system in the back from the days of the Cuban Missile Crisis. My dad was old enough during the crisis to remember the crisis it happening, and his older brother was in the Air Force at the time ready to respond if an incident took place. With this perspective it was fascinating to hear my dad’s thoughts on the bunkers, the most interesting being the realization that the Cubans were just as afraid of Americans shooting missiles back at them as we were of being shot at from Cuba. During our trip we also learned that the Cubans had no control over the missiles: the largest Soviet military presence in Cuba occurred when the missiles were placed there, not because of the American threat, but to prevent the Cuban people from taking the missiles from the Soviets. For dinner walked to a restaurant on the water front to enjoy a pitcher of sangria and the most typical Cuban dish, ropa vieja. Literally translated as “old clothes,” this dish of shredded beef and tomatoes had the perfect amount of spice and tenderness for me to say it was the best ropa vieja I’ve ever had! After dinner, our itinerary included a night out with live music, but we were so tired from the traveling and walking of the day that we went right to bed. 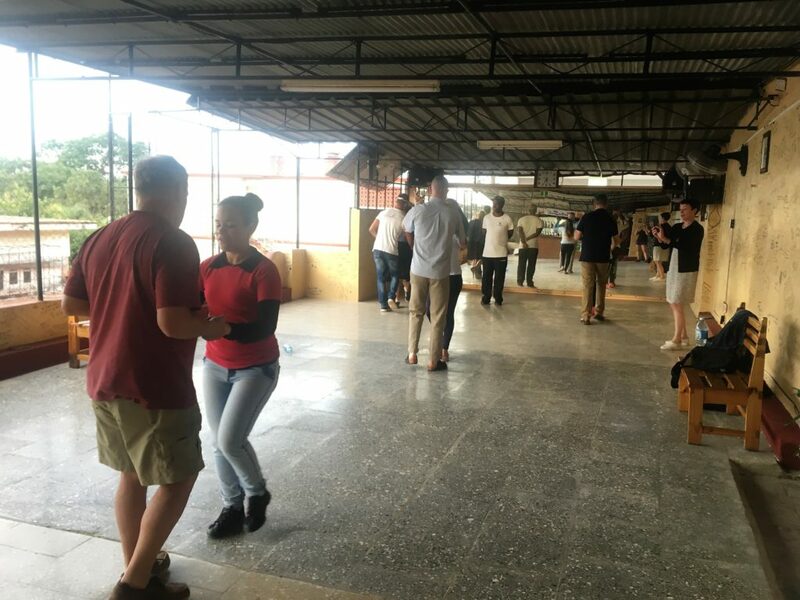 We had also been thinking of visiting Club 1830 for salsa dancing, but it was raining and we were told that the club doesn’t have a roof, so we would be the only ones there if we went! Interested in your own Havana Itinerary? Check out the article One Day in Havana. The second day of the trip was filled with a 10-hour tour into the countryside to see how Cubans outside Havana live. We began the day with breakfast at Locos por Cuba, where we met our tour guides Alex and Leo, two young economics and political science professors at the local Universidad de la Habana. We also joined up with the four other visitors, a couple from San Francisco also in Cuba on the Support the Cuban People visa, and two friends traveling together from Florida and Maine who were visiting on an educational visa (they were establishing connections for a return trip with community college students later this year). 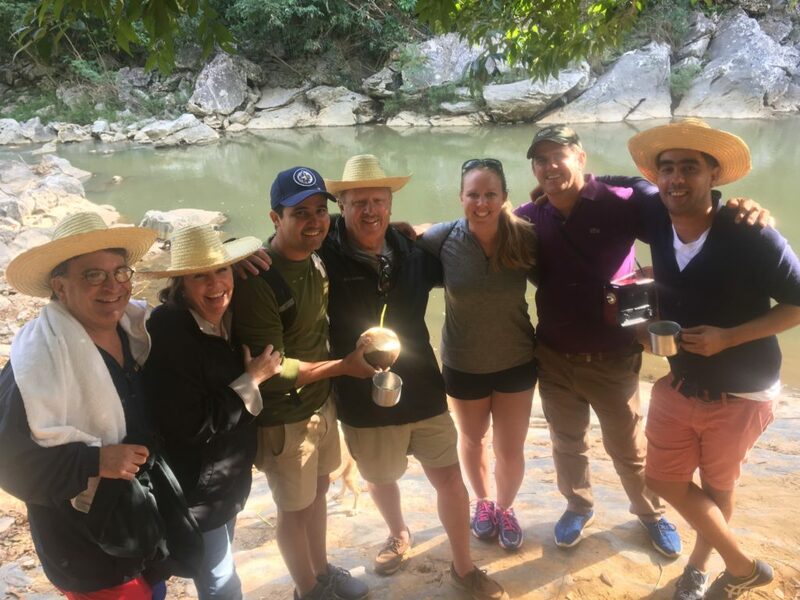 After a two-hour van ride to Viñales, during which the driver stopped at a true pit-stop – a guy standing on the side of the road selling food and drinks he kept in the woods behind him – we arrived at our farm for the day and met the local family. When Castro took over Cuba and implemented Communism, all families were given a house, and those in the countryside were also given land. Because of this, there are no homeless people in Cuba! However, there is also no money to buy additional property, so generations of families live in the same house their family was provided in 1959. On this particular farm lived the grandmother, the father and mother, and at least three children. The house contained exactly five rooms: a kitchen, a bathroom, two bedrooms, and a dining/living room. It was not a lot of space for a large amount of people, but the family didn’t seem to mind. We began our tour tasting the different fruits of the farm. The entire property is self-sustaining, with everything they need for consumption found on their own land. We tasted fresh oranges, plantain chips made in front of us from plantains picked from the farm, and coffee that was grown, harvested, roasted, and ground on-site. Even the water was collected and purified on the property, and the fish we had later for dinner was caught in the river running through the farm. 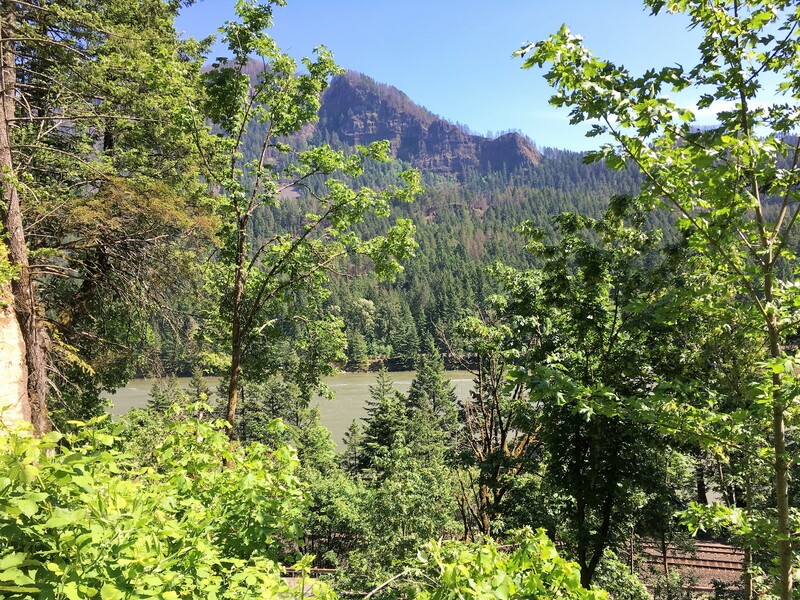 After exploring the area around the house, we went on a hike through the many acres owned by the farmer and his family down to the river and bat cave. 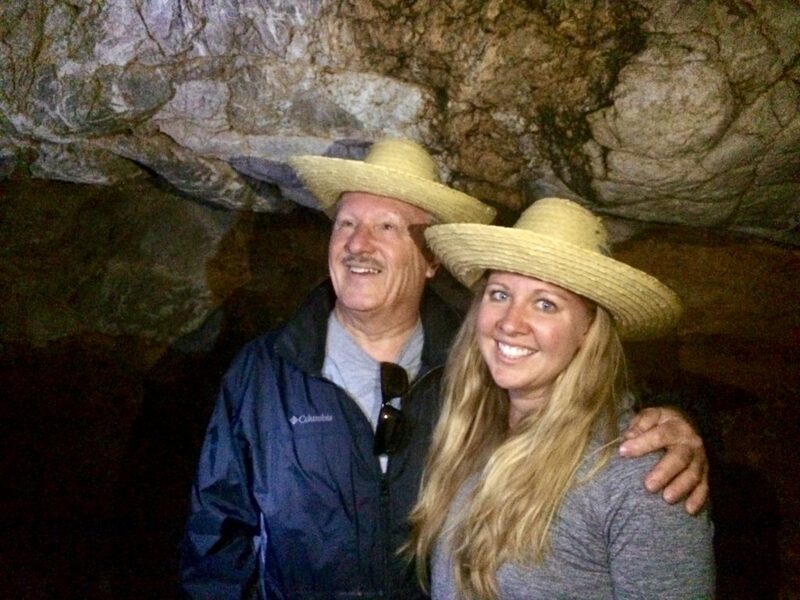 We crawled our way through the bat cave until we were standing right under the bats: it was recommended we all wear hats for this part to avoid bat droppings on our heads. On the way back from the cave we stopped by the river for a swim and to learn more about life in Cuba from our guides and the farmer we were visiting. It was wonderful to hear our guides sharing their opinions, both positive and negative, about various aspects of Cuban life, economics, and politics. 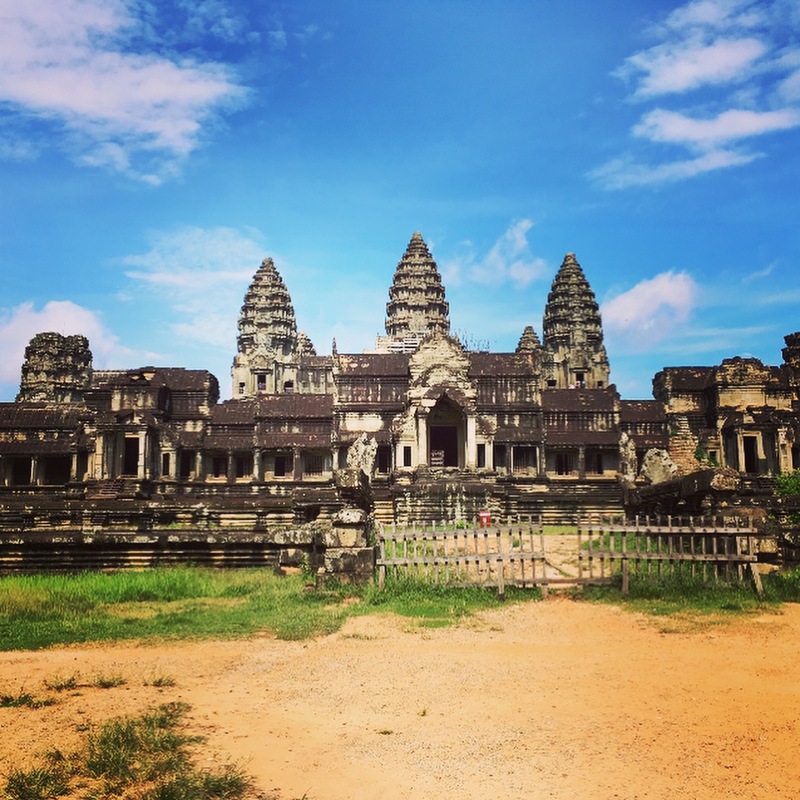 One of the guides stated that he would like to see more democratic and capitalistic features in Cuba, but also to maintain the free education, healthcare, and housing on which so many people rely. 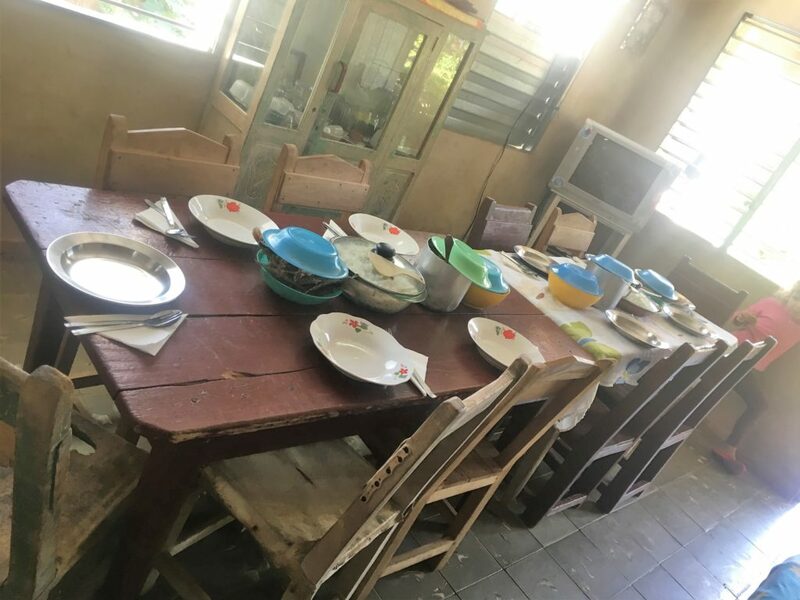 Finally, we were invited to share a meal with the family before heading back to Havana for the evening. 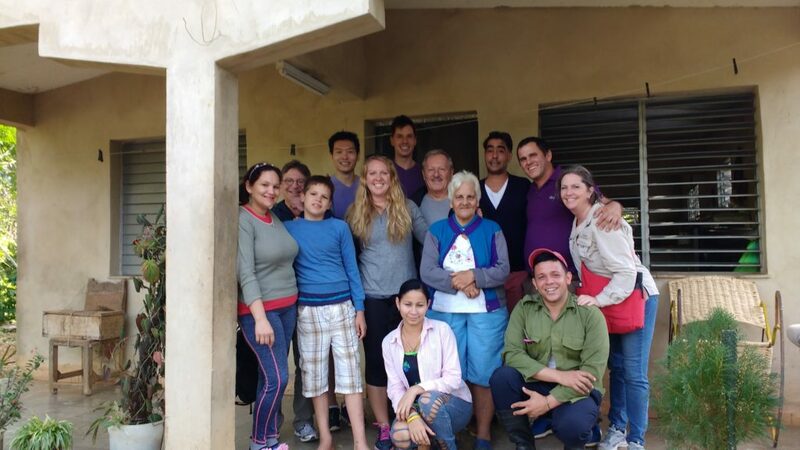 The experience we had that day on the farm is something I will never forget, and I definitely encourage anyone who visits Cuba to consider this experience! Our final full day in the country included a 5-hour bike tour of the city in the morning, followed by rooftop salsa dancing lessons from locals in the afternoon. I was really looking forward to this day, especially the salsa dancing, but unfortunately got sick the night before. Regardless, I still went out and made the best of it, though every time my dance instructor asked if I was ok, all I could replay was “sí, sí, estoy bien,” rather than “I’m just trying not to throw up on you.” Please learn from my mistake and don’t let your guard down on any raw or potentially unwashed food in the country: I think that may have been my downfall! 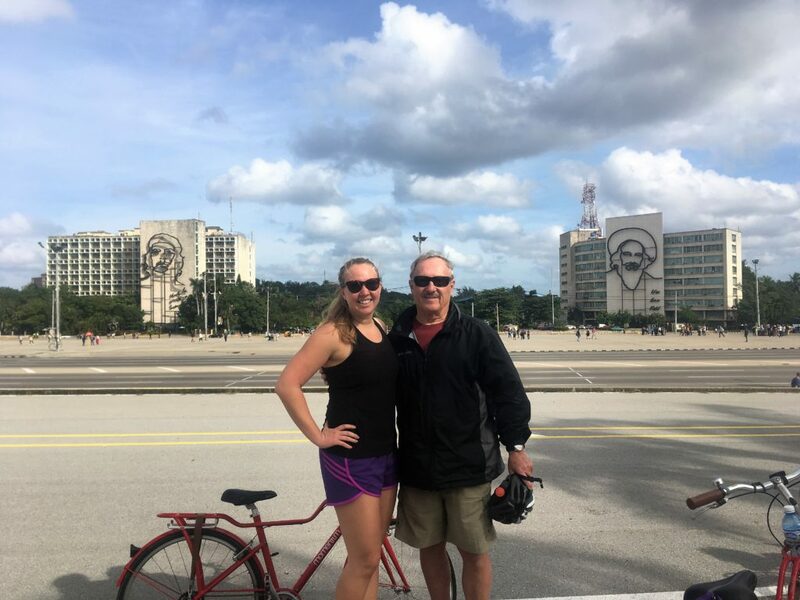 Taking a bike tour allowed us to experience many areas of Havana that would have been difficult to get to from our AirBNB. The start of the tour was in the Vedado area of the city, which gave us the opportunity to ride in one of the classic car taxis! While my dad was very disappointed to learn that the only original part was the body, and that the engines were all old Soviet car engines from the 80s and the 90s, we were happy to get our old-car ride in for the trip. 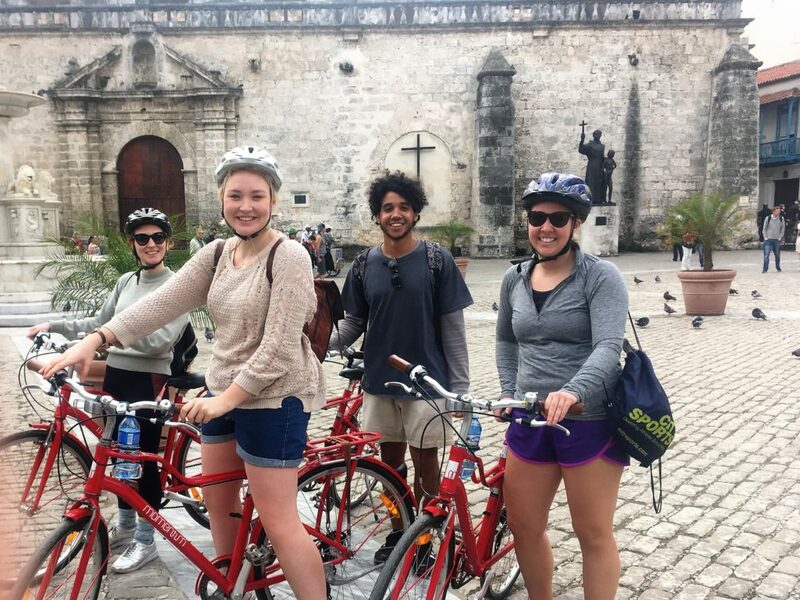 The main stops of the bike tour included the Havana Forest, Columbus Cemetery, Revolution Square, Old Square in Old Havana, and El Malecon. Our tour guide was another professor from the Universidad, and our tour companions were two young British girls in Cuba on holiday for a week. Taking a bike tour in Havana is a great way to experience a large part of the city while also getting in your vacation exercise! Metal sculptures of Guevara and Cienfuegos flank Revolution Square. As Castro would stand at the front and make his speeches to a filled square, his two other revolutionaries would be looking back at him. For our last afternoon, we had signed up for rooftop salsas dancing lessons. We were picked up from our AirBNB, brought to the studio, and matched up with partners based on our gender and abilities (I have many years of basic salsa experience as well as other dance experience, while this was my dad’s first time learning it). Having a private lesson for over 2 hours was so much fun! My instructor began by dancing with me, and when we would try a move I was clearly unfamiliar with he would stop, teach me the move, and then continue dancing to practice. I felt like I was just out dancing normally, and yet had a dance partner who wouldn’t get frustrated if I was unfamiliar with something or messed up a move, but instead had unlimited patience to continue teaching me. My dad reported a similar experience with his instructor. After class we were returned to our AirBNB by the same driver. We made it a point to book reservations far in advance for dinner at La Guarida, considered one of the best restaurants in Havana and the place where anyone who’s anyone stops by at least once when they’re in Cuba: Madonna celebrated her 58th birthday here, and Beyonce dined here with Jay-Z on their most recent trip to the city. The building – like most in Havana – looks on the outside like it was once beautiful but is now about to crumble down on top of you. Once you get past the bouncer, you climb up five flights of crooked marble stairs past empty floors that are now ghosts of their former glory and opulence. However, once you get by all this and reach the restaurant on the top floor you are in for a wonderful surprise: La Guarida would be considered fine dining even in the United States. The decor is contemporary and the space is small, with many different rooms and two small balconies seating diners, but you feel special from the moment you arrive, and the food and drinks are incredible! While I was still somewhat sick from the night before and did not get to enjoy the restaurant as much as I wanted to, I highly recommend it and cannot wait to go back and try it again next time I am in Cuba. Cuba is not off-limits for Americans, so long as you don’t mind an active vacation that involves staying in an AirBNB and eating in local, family-owned restaurants. There are some precautions to take and things to know before you arrive, but the people are super friendly, the city of Havana is safe, and the country of Cuba has such a rich, unique culture that must be experienced firsthand. If you are interested in staying in the AirBNB or participating in the activities described above, you can follow the links below. First-time AirBNB users can get a $40 credit here: www.airbnb.com/c/kellys8303. Thank you! I hope you have the chance to visit, it’s much easier to travel there than I ever imagined! Oh, Havana…you are definitely calling me. You even had salsa lessons! How much fun your trip looks and sounds. Thank you, it was a blast! It’s so wonderful to read about the different experience in Cuba.. Usually it’s just the Havana city! The farm family visit is more vivid and beautiful experience. I would love that too.. Thank you! The farm visit was one of the highlights of my trip, I agree I am glad I saw more than just Havana city. Cuba is an exciting destination. Not so crowded that you can still see much as it has been in recent years. I would also like to learn salsa directly on site! Agreed! There were more tourists than I expected but you still get the feel of “real” Cuba, not a place overrun with tourism. Gorgeous photos! Great call to go somewhere warm and escape part of a New England winter. Can’t wait to visit. Thank you! Heading south in the winter is always a great idea when you live in New England! Long been on the list to visit Havana, and also the rest of Cuba. We’ve had several opportunities, but just have not managed to connect all the dots and make a trip happen. Soon I hope. Every article I have read (including your post about your weekend adventure with your dad) and every friend I have talked to who has already been make Cuba sound (and taste) amazing. I hope you get the chance to go soon, it’s really an amazing country! Havana seems amazing! I was so glad when the US decided to allow Americans to travel there once again. Your trip to the farm sounds awesome! I would love to do that if my husband and I ever go to Cuba. Thank you! I was very glad too, I hope the restrictions remain relaxed so more people (such as yourself) can experience this beautiful country! It definitely looks and sounds like you had a fabulous trip! Super cool too that you got to check out the birthplace of mojito. I love how you shared all of Cuba’s beautiful gems with us rather than just their iconic colorful vintage cars – like most do on Instagram. Would for sure love to visit now and will defs have to read up on visiting as a Canadian! You should absolutely go! I don’t know much about Canadian travel requirements, but if they are more relaxed than the U.S. (as I imagine they will be) then you will also have more time to experience some areas like the beautiful beaches in the country as well! The drinks at La Floridita were the best! I’m so jealous that you got a Barbie pink car picture! 😉 I think I got every color BUT my favorite. LOL I didn’t tour the Hotel Nacional but I did love the artwork inside and how everyone sits out front and in the lobby sucking up the only WIFI for miles. LOL Fun trip. Looks like you had a blast. Thank you! That car picture was a very lucky capture as it sped by on the road in front of me. I’m glad you had a great experience in the country too!